I’ve always made my stocks/broths in a stockpot on stovetop. But I will soon be doing a dietary protocol to help me heal from an autoimmune disorder, that requires drinking bone broth every day. Using a crockpot makes it very simple to make and requires little of your own time doing prep work. 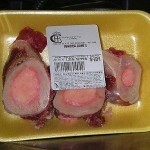 To make the broth, you can use marrow bones stripped of their meat, or leave the meat on. Adding veggies and herbs is optional, but definitely enhances the flavor. Bones: Chicken bone broth can be made with fresh bones or leftover bones from chicken previously cooked (leg, thigh and wing are best because they are richest in bone marrow). Another option for chicken bone broth is whole chicken legs, bone-in and skin-on. 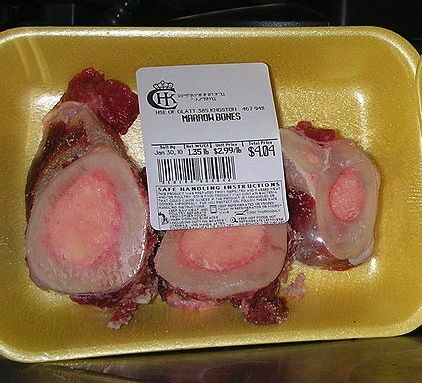 For beef bone broth, use marrow bones (as pictured above), or you can use oxtail and/or short-ribs with the meat attached. IMPORTANT: Always use bones from pasture-raised and finished livestock. You can use any crockpot for the chicken or beef bone broth, as long as the crock is lead-free ceramic, and the lid is glass. Most crockpots have at least two settings: low and high. You can wash and then coarsely chop the veggies, or just wash and trim them, then add to the pot whole. Place veggies and bones or bony-pieces in crockpot (except parsley). Add apple cider vinegar (ACV). Pour water over. Cover with lid and turn crockpot on, and cook until done (see recommended timing, below. Remove large chunks with slotted spoon (optional), then strain. I like to line my strainer with a piece of loose-weave cotton (such as good-quality cheesecloth). Season strained broth with unrefined sea salt (or at least with salt that has not been iodized). This recipe is adapted from several recipe blogs: Wellness Mamma (2), Dr. Axe (3), Healthy Maven (4) and The Healthy Foodie (5). If using raw bones, especially beef bones, place them in roasting pan or on baking sheet and roast in preheated 350° – 375°F oven for 30 minutes. This greatly improves the favor of the broth. Wash and trim veggies; leave whole or chop coarsely. Place bones in large bowl and cover with filtered water. Add vinegar, then let sit in cool water for 30 minutes. Place veggies and herbs (except parsley and garlic) in crockpot; place bones on top and pour water over (from bowl plus extra to cover the bones). Cover with lid and turn on crockpot to ‘low’ setting. Cook for 8 – 10 hours. You can skim off any ‘gunky froth’ after 1 hour, if desired, and repeat every 20-30 minutes until it no longer produces the froth). Add optional parsley and garlic for last 30 minutes of cooking. Remove large chunks with slotted spoon (optional), then strain, using a ladle to transfer broth to the strainer. I like to line my strainer with a piece of loose-weave cotton (such as good-quality cheesecloth). The broth will look like a chunky jello after it has cooled. Store in fridge for a few days and in freezer for several months. To reheat: ladle the chunky jello into a saucepan and bring to a boil. Remove to cup and sip! This entry was posted in Beef, Buffalo, Bones, Equipment, Fat or oil, Fish, Game, Health, Herbs, Lamb, Leafy Veggie, Medicinal, Onion family, Poultry, Root Veggie, Vinegar and tagged apple cider vinegar, beef, bones, buffalo, carrot, celery, chicken, fish, garlic, herbs, onion, venison. Bookmark the permalink.